Five hundred years ago Michelangelo began work on a painting that became one of the most famous pieces of art in the world-the Sistine Chapel ceiling. Every year millions of people come to see Michelangelo's Sistine ceiling, which is the largest fresco painting on earth in the holiest of Christianity's chapels; yet there is not one single Christian image in this vast, magnificent artwork. 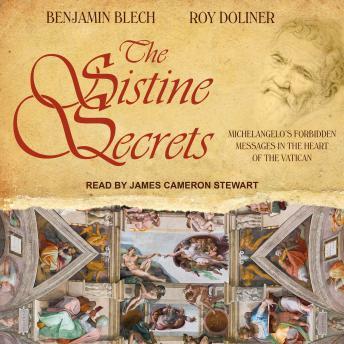 The Sistine Secrets tells the fascinating story of how Michelangelo embedded messages of brotherhood, tolerance, and freethinking in his painting to encourage 'fellow travelers' to challenge the repressive Roman Catholic Church of his time. Blech and Doliner reveal what Michelangelo meant in the angelic representations that brilliantly mocked his papal patron, how he managed to sneak unorthodox heresies into his ostensibly pious portrayals, and how he was able to fulfill his lifelong ambition to bridge the wisdom of science with the strictures of faith. The Sistine Secrets unearths secrets that have remained hidden in plain sight for centuries.